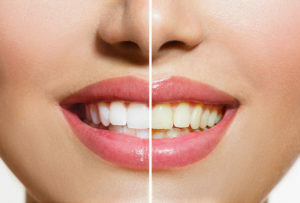 What You Need to Know About Teeth Whitening | Smile Logic, Inc.
Did you know that people with whiter teeth have more success in work and love? Before you go to your dentist for teeth whitening, let us look at what you need to consider. You want to understand why your teeth are yellow, how sensitivity varies for every person, and that there are different strengths in teeth whitening products. In this lifetime, you only have one set of teeth. It is important to educate yourself before making a decision. First, you should ask yourself, is it safe to whiten your teeth right now? This fact is why it is so important to speak with a dentist. There are a ton of over-the-counter products available, but you could damage your mouth. If you have exposed roots, cavities, gum disease, or perhaps other issues that are not treated yet, you could create more pain and problems. You do not want to waste your money. Talk to a professional and find out the next steps. Yellowing teeth is normal, just like graying hair is for a senior. The inner part of the tooth is called dentin and enamel is the outer part of the tooth. If you grind your teeth and eat or drink acidic beverages and food, you can wear down your enamel. This process is why your teeth appear yellower. Dentin is reflected through the enamel, and your teeth will look stained. Protecting your enamel is key to limiting this process over time. Stains are also caused by everyday drinks, like coffee and dark pop. Now that we know why teeth turn yellow, now we want to examine the various products you could try. OTC treatments take a long time. These treatments are still quite expensive. If you do not apply them correctly, you could irritate your teeth and gums. They do not come close to the effects you would receive from a whitening treatment from a dentist. If you are invested in whitening your teeth, you should consult a dentist. As a professional, they can go over the procedures available and the pros and cons for your situation. If you would like to hear what our customers say about our services, including teeth whitening, check out our testimonials page. Everyone’s teeth are different, and one approach may work for some but not all. We all react differently to various treatments, and the same occurs with teeth whitening. This reality is why it is so important to work with a registered dentist who can assess your lifestyle and needs. Something to remember is that teeth whitening will not be an option for everyone. Women who are breastfeeding or pregnant, kids who have baby teeth, and people with sensitive teeth and gum disease should not have their teeth whitened. In this article, we discussed some important factors to consider if you are interested in teeth whitening. Are you in a place to whiten your teeth? Do you have any present issues that need to be first taken care of? For more information about how to protect your tooth enamel, contact us for an appointment.